There’s nothing quite like a great special, especially for each day of the week. Our Steak Special will have you looking forward to Mondays, or at least improve your day with the taste of a satisfying, tender rump. 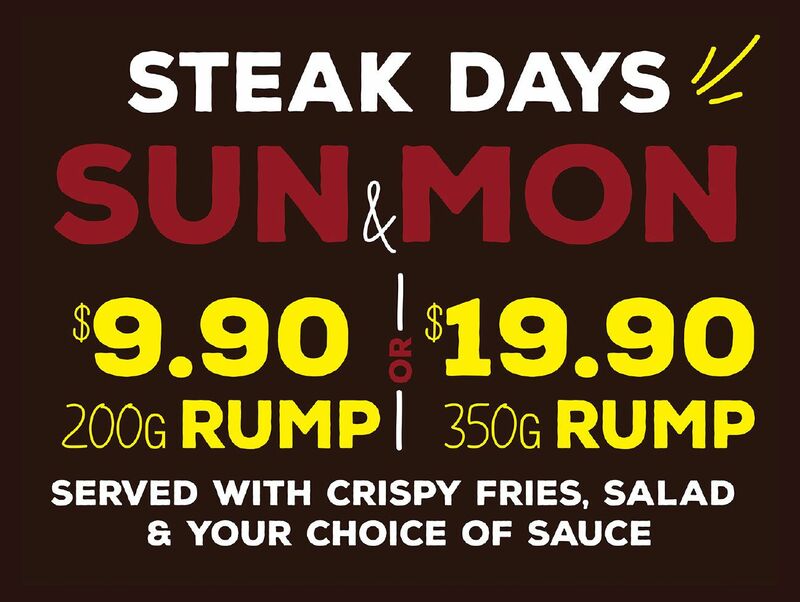 Available in two sizes, 200g rump for $9.90 or 350g rump for $19.90, the choice is yours! With a serving of hot chips, fresh salad and sauce, there’s hardly a better way to start the week. Don’t fret if you missed the Monday special, as it returns Sunday to help finish the week on a high-note! Who doesn’t love a free upgrade? Tuesday can work up a big appetite, so it only seemed fair to offer a meal upgrade for free to our patrons. Order a serving of our favourite Main Schnitzel or Parmy and receive the larger 1kg dish at no extra charge! This special certainly isn’t for the faint-hearted, but we welcome you to either tackle this alone or share your meal with a friend. 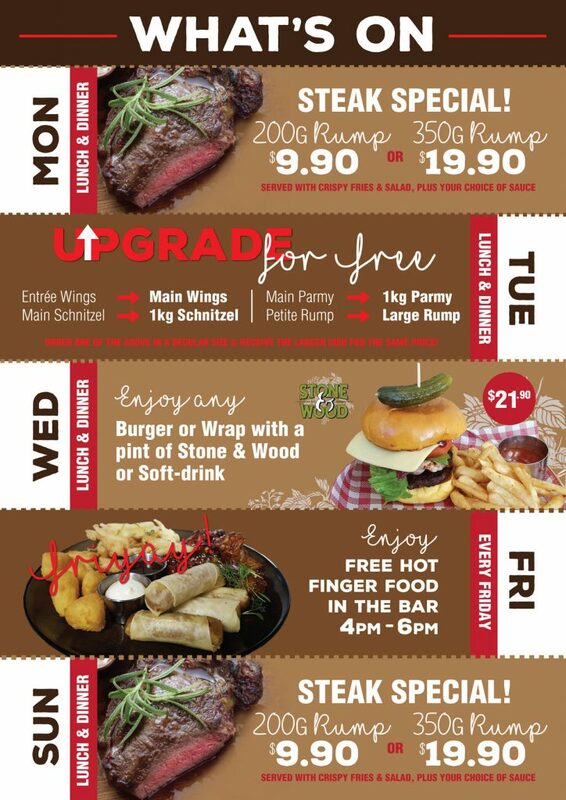 Wednesday, Hump Day, is a milestone for the working week and best spent with a mouth-watering meal in one hand and cold drink in the other. Enjoy your choice of Burger, Sandwich or Wrap with a pint of Stone & Wood or Soft-drink for only $21.90 every Wednesday for lunch and dinner. Treat yourself for making it this far into the week! It’s hard to improve on Friday, arguably the best day of the week. But they say the best things in life are free, so enjoy hot finger food in the bar from 4pm – 6pm for FREE. Food always tastes better when it’s free and when all the cooking and cleaning is handled by someone else! Let us take care of you this Friday when you decide to kick-back and relax. Have any of our specials caught your eye? Book your table by phoning (07) 3844 3236.